Logging to a file is great for development. You can tail your log file with the help of Terminal.app and on release you can attach the log file to an email or send it to your server. The file location is adjustable and on default the file is stored in the Document directory of your app. 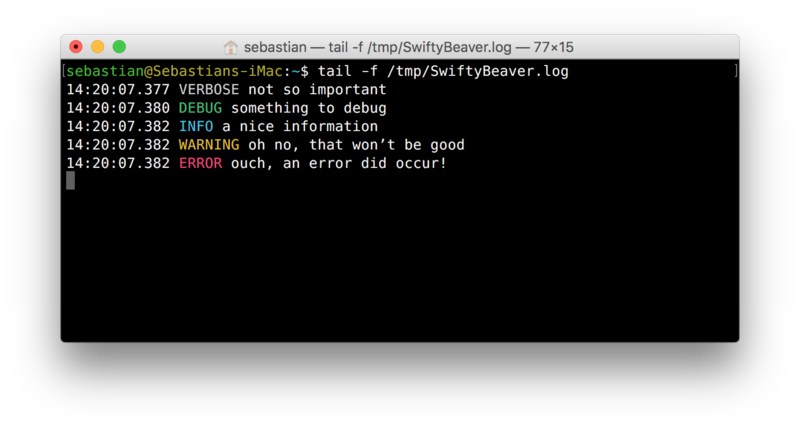 SwiftyBeaver Framework automatically adds color to each log message without the need for 3rd party plugins. To start logging to a file you just need to instantiate FileDestination(), optionally adjust the properties and then add the instance to SwiftyBeaver itself. Logging in a different format to multiple files is possible if several file destination instances are created and added (example see further down below). A non-existing file is automatically created. You can adjust the logging behavior with the following properties of FileDestination(). .asynchronously true Runs on own serial background thread for better performance. Set to false during development for easier debugging. .minLevel .verbose Any level with a priority lower than that level is not logged. Possible values are SwiftyBeaver.Level.verbose, .debug, .info .warning, .error. .levelString.verbose, .debug, .info, .warning, .error "VERBOSE", "DEBUG", etc. Sets a custom string representing the log level. On default it is the log level as uppercase word.